Spain’s response to the Louvre, the Prado Museum is a marvel of art and history. On this 2 to 2.5 hour semi-private tour, you and up to 8 guests will explore this world-class collection featuring some of Europe’s most famous artists. One of the most visited sites in the world, the Prado is essential for any trip to Madrid, and your enthusiastic guide will bring the most famous works alive during your tour. Housed in an 18th century neoclassical building, the Prado Museum displays thousands of works from its vast collection, spanning the 1200s to the 1900s. 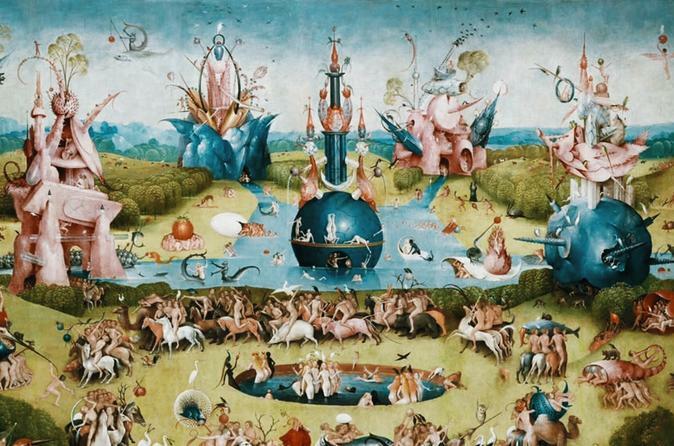 Some of the stand-out pieces include “Las Meninas” (The Maids of Honor), an inventive self-portrait by Spanish-born Velázquez, and “The Garden of Earthly Delights,” a triptych from Dutch painter Hieronymus Bosch. You’ll wander its hall as your expert guided reveals the stories and secrets behind works by Goya, Fra Angelico, El Greco, Rembrandt, and others. Explore the largest collection of Italian masterpieces outside of Italy in addition to a fine selection of prints and sculptures. Whatever you do, don’t leave Madrid without experiencing all of the entrancing works that the Prado has to offer.